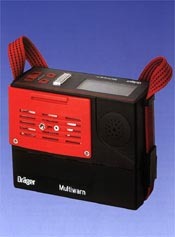 The MultiGas Detector & Monitor is the most versatile and powerful multigas detection instrument available on the market. Compatible with more as 20 electrochemical sensors, two catalytical sensors for combustible gases and two infra red sensors it is ideal for monitoring all types of toxic and combustible gases as well as oxygen overflow in ambient air. Used by NATO forces and world governments for detecting Chemical warfare agents and other toxic substances.